The Commodore PET 2001 was a very successful machine. Four models were made: early 4KB models, the PET 2001-8N with 8 KB RAM, PET 2001-16N with 16 KB RAM and the PET 2001-32N with 32K RAM. This mchine was conceived by Chuck Peddle who later joined Tandon, a drive manufacturer. The static RAMs in the early 2001's got so hot that they would often "crawl" up out of their sockets over time. The "official" solution? Re-seat the chips and put a nylon wire tye under the socket and over the chip to hold it snuggly in place. More trivia: Microsoft "quietly" wrote the BASIC used in the 40-column PETs. Proof? Type: wait 6502, 10 and "MICROSOFT!" will be printed on the display 10 times. (99% sure this is true...). The following app will cause the Pet 2001 to catch fire!!! Guy Tailor's report is probably untrue as it was generally known that it was impossible to damage the original PETs by any programming, including fast, (if fast is the right word) POKEs. I've never heard of the keyword 'motor' in any of the 'toolkit' ROMs that I've used. Even flipping bit 3 of $E813 on and off, which would turn motor 1 on and off, would probably not cause it to catch fire. Especially as the IRQ service routine would normally turn off the tape motors, unless the status flag for the cassette was poked to a non-zero value. Guy Tailor's program actually relates to the BBC Micro & Acorn Electron. The PET did not have a "motor" command. In any event, all it did on the BBC was burn out the motor relay. it's an 'urban myth' which was made up about the BBC Micro. 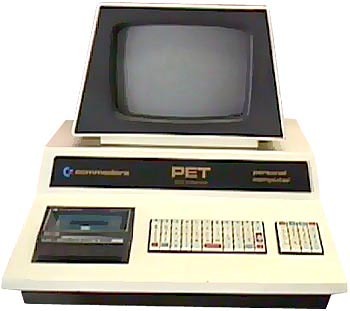 However, it was based on a true story about the PET - there was a location you could poke to do with the graphics frequency which if you set it wrong could cause the HT supply in the monitor way over-voltage, which would sometimes break down the transformer. This came up in the PCW magazine* after someone wrote "it is impossible to damage a computer with bad software". Chuck Peddle himself said that despite the official name, the Personal Electronic Transactor, is not what it is really named for. From seeing the Pet Rock fad take off, Chuck thought "if this guy can make 15 bucks or so from selling a rock, then if this computer is named like it, the PET should surely succeed." see more Commodore PET 2001 Ebay auctions !